Hitch Rider Long Bed platform bike rack. 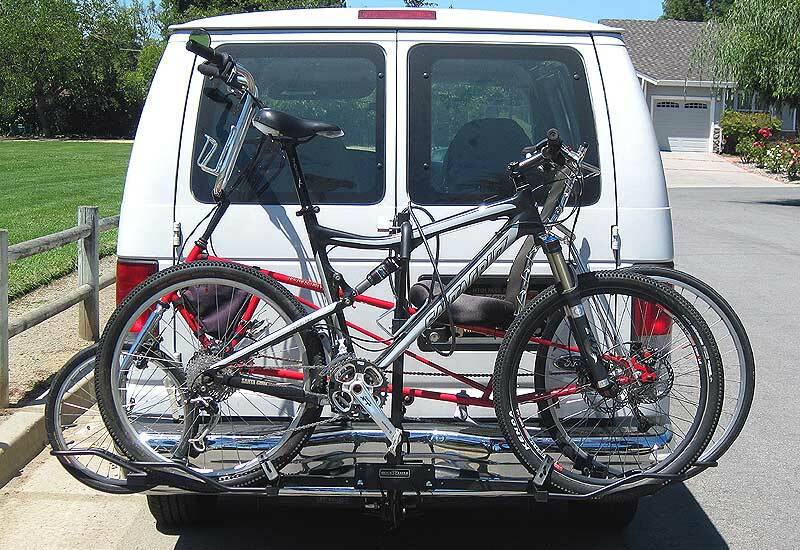 Our Long Bed™ hitch mount bike carrier is a platform style two bike rack that carries all bicycle styles, including LWB recumbent bikes and tandem bicycles. 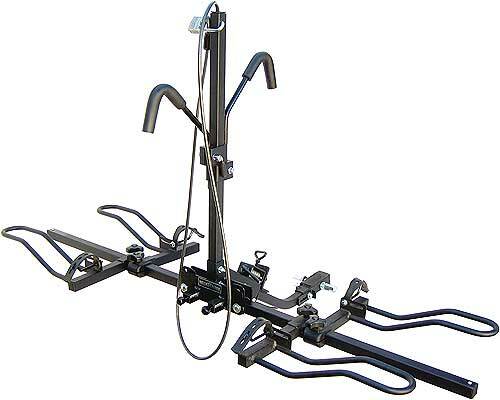 Rack includes bike security cable with padlock, locking threaded hitch pin (Hitch-Vise not required), solid steel 1 1/4" hitch bar, and 2" hitch adapter (patented). Roll Around™ bike rack handling wheels (patents pending) available separately makes moving the rack around, installing in hitch, and storing easy. Adjustable wheel holders accommodate bikes up to 74" wheelbase and fit 16" to 29" size wheels up to 2.5" wide. Rack weighs 50 lbs. empty. More rack specifications. Rack tilts for vehicle access and automatically latches up when raised. Wheel holders fold up when empty so nothing protrudes from sides of vehicle and superior access is available from both sides. Padded hook secures bike frame and fastens with a quick release lever. Sturdy hook mast accommodates a rack stabilizer strap. Rack free-stands when folded up and uninstalled, making it easier to handle and store. Rack comes completely assembled; just install the pivot bolt before use. High Lift™ conversion kit available to transport LWB recumbent and tandem bikes at an angle, reducing load width on smaller vehicles. Trike conversion kit available to transport a trike with a bike. Read important safety information before ordering. Rack is not for use on trailers, 5th wheels, or vehicles with a hitch that extends more than 6 feet outward from the vehicle's rear axle. Bike racks ship within 1-2 business days via FedEx Ground. Shipping is automatically calculated by the shopping cart when placing your order online. Estimate delivery date and shipping.